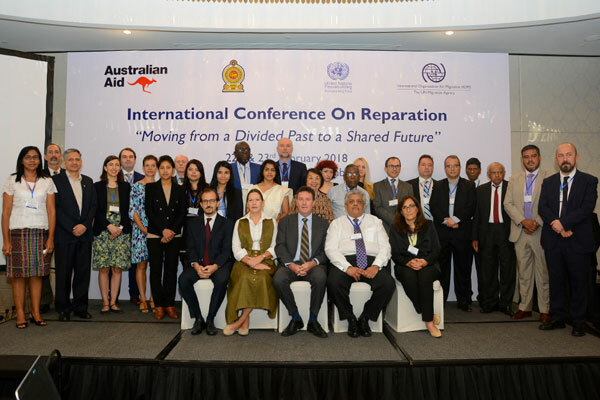 Reparations are essential in leading to a process of reconciliation and it should be done in parallel to a process on truth, justice, and non-recurrence, Secretary of the Secretariat for Coordinating Reconciliation Mechanisms (SCRM), Mano Tittawella said. He said this in view of the two-day international conference organised by the SCRM, International Organization for Migration (IOM) and the UN Migration Agency on reparations for conflict victims. The conference was launched in Colombo yesterday. In a statement, the IOM said this was the first such conference to be held in Sri Lanka since the end of the war in 2009. “The conference follows the UNHRC Resolution on Sri Lanka and a government decision to actively promote reconciliation, including a system of victim reparations, that will contribute to a lasting peace,” it said. IOM Sri Lanka Chief of Mission Giuseppe Crocetti said transitional justice is a relatively new field which is being expanded and enriched through experiences from many different societies across the globe. “A solution in one country or community does not necessarily work for others, particularly in relation to finding the right balance between what is desirable and what is feasible. It takes a whole of society approach to move from a divided past to a shared future and that is the underlying theme of this conference,” he said. The conference brought together some 150 participants from the government and non-government sectors, development partners, UN, local and international NGOs, civil society organizations, victim groups, academics, experts and other relevant stakeholders. The German Nazi paid reparations for the damage caused to other European nations. It's a punitive payment. The Sri Lankan govt accepts it committed crimes thus pay for the damages? Whom did it commit crimes against? It was not the Nazis who paid reparations, but the democratic German government, which was freely elected after the war. Not only other countries were paid reparations but also the victims of National Socialism within Germany were voluntary compensated. For a peaceful coexistence of the different ethnic groups in Sri Lanka it is indispensable that all civilian victims of the civil war are compensated by the government. LTTE and its sponsors have funded human misery in Sri Lanka for 30 years. Are those ltte funders going to pay reparations? Reparations should be paid to ALL those who suffered from LTTE terrorism. So far, all emphasis is on the north and east only. What about those in the rest of the country who suffered from LTTE terrorism.? The TNA should accept responsibility as it was allied to the LTTE. Terrorism was supported by the TNA and funds from LTTE supporters outside Sri Lanka. They should issue an apology and be paying for the damage they caused in the entire island. The TNA and Indian should take total responsibility for the 30 year carnage in Sri Lanka and pay reparations to all those who suffered under it. The father of this fellow would have been a LTTE terrorist.